The Brynn Natural Blue Fox Fur Vest with Collar for Women is a lush style for her to pair with a simple t-shirt or elegant dress. 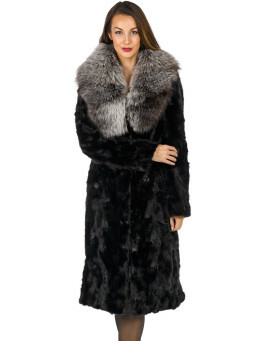 This posh design features genuine natural blue fox fur in a fluffy appeal. A matching Peter Pan collar is stylish and functional. Pair this piece with an optional matching detachable hood for a versatile effect. A satin lined interior is amazing over any outfit. Two slit pockets are exceptional to go with three front concealed hook and eye closures. This designer piece is high-quality to display beautiful pleating and all natural coloring for winter. Crafted in all Natural Blue Fox Fur, this fur features an amazing frosted white coloring. Comparable to a crisp snowy day. Blue Fox Fur is not only an amazing natural color but it is also a thick and plush fur which offers unparalleled warmth.